August comes to a close in just a few short days. I can hardly believe it. With September on the horizon, soon I will be saying, “baby is due next month”. It’s felt so far away for so long. It’s still a number of weeks yet (I’m 32 weeks along as I write this), but the anticipation and waiting is almost over with. Soon we’ll meet this tiny human. I’ve mentioned before that my goal was to run through at least May and play the summer by ear, knowing the heat might be a problem, or just the stage of pregnancy. Here we are on Aug 28th, and I’m still running. I think I achieved my goal! I think the lesson here is to never sell yourself short and to be flexible. It’s always important to check in regularly with reality and be willing to adjust a goal. If you don’t then you run the risk of your end result being completely out of alignment with your expectations. Sometimes reality says, “This is too much for you; back off.” This was my 2014. 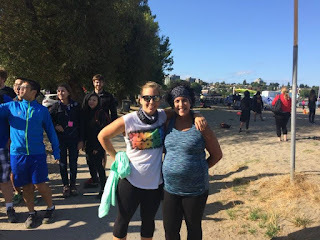 I was overdoing it and realized I needed to downgrade a planned marathon to a half marathon or risk burnout or injury. I adjusted the goal, so when I reached the finish line in Calgary, I was elated rather than deflated. But often reality says something a little different: “Actually you’re way more badass than you think; you can and should absolutely do more, safely.” This has been the case this summer. I find that running through this pregnancy journey I’ve been constantly reassessing and surprising myself with what I can do. I feel I’ve challenged myself the right amount because I’ve been honest with what my reality is. The difference might be the nature of the goal I set. For example, when the goal is to complete a distance event, the roadmap for getting there is to ensure base mileage is completed, and long runs reach a certain level. For a time-based goal, certain speed and power workouts are also essential to that roadmap. But when the goal is to remain active for fitness and mental/physical well-being, the roadmap isn’t as clear. There are many paths one can take to reach the same summit. Whether I run there, walk there, swim, dance, yoga it up the mountain, all methods will take me there. When I first designed the map, I assumed running wouldn’t be a huge part of the journey. But being my favourite sport, I’ve prioritized running and have pleasantly surprised myself with its continued prevalence in my journey. Don’t get me wrong – pregnancy hasn’t been all roses and sunshine. It’s been difficult. And I have to also clarify that running isn’t always amazing and easy, even for someone like me who’s been proudly running for years now. It’s often sucky and hard even when I’m not pregnant. Running is difficult by nature, and I think that’s why I love it so much. You need to be driven to succeed in this sport. Reaching a finish line wouldn’t be such an achievement if the road there wasn’t incredibly hard. Pregnancy adds a whole other list of challenges to the already difficult sport of running…The added weight. The reduced lung capacity. The increased heart rate. The nausea. The achiness. The overactive bladder. The shortened stride. The waddly gait. My list could go on and on for miles of complaints. But neither running nor pregnancy was designed to be easy, and Zahida was certainly not designed to let challenge get in her way. 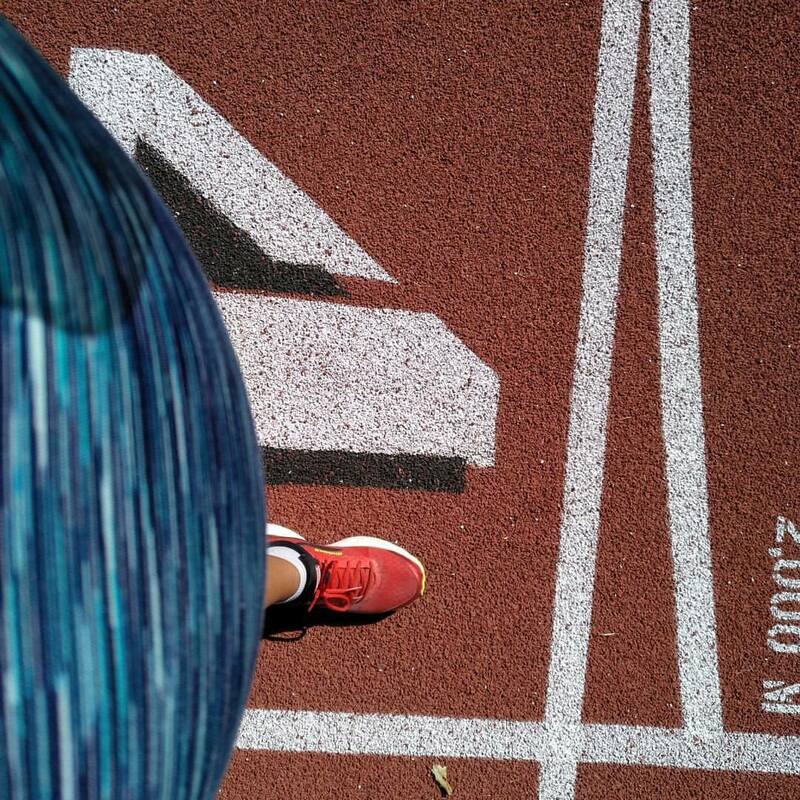 Being able to run in spite of the added challenge of pregnancy has been incredibly empowering. It’s been tangible proof that I can do anything. A woman’s body is strong, capable, and grows life. My body continues to amaze me daily – no matter how it’s changed over the last 7.5months, I have been able to remain consistent and true to myself in my sport. Now matter how difficult a workout feels during, I continue to feel great after, and I continue to crave the next workout. This is the reward or the reinforcement I need to know I’m doing the right thing for my body. This is the evidence of my character I need for the endurance event of my lifetime that’s around the corner – bringing my child into the world. The last week or so of running has been super awesome, but not without challenge! On Aug 19th, I participated in a free 5K event coinciding with Kits Fest at Kitsilano Beach. The run was organized by the Vancouver Marathon Society and just happened to land on my friend Monica’s birthday. We ran together and had a blast. While part of me wasn’t thrilled that it took me 39minutes to complete the distance (my slowest 5km since I was a beginner), to put it into perspective, that’s really not that slow for being 31-weeks along at the time. There were certainly a couple of incline / challenging sections that required me to walk. 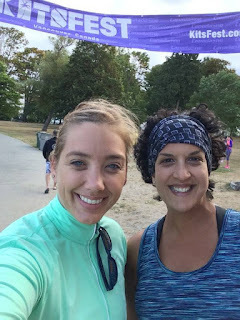 Pre-run selfie - getting ready to run! One of my favourite moments of the experience was in the pre-run moments where we were all milling about and socializing and two ladies approached me. They saw my belly and asked if I was planning on walking the event like they were. I told them that no, I was planning to run, and they were surprised and genuinely appreciative of my response. We saw each other on the course, as there was a small out and back section, providing a lovely moment of cheering each other on. I hope that in some way I inspired them a little. Runners truly do come in all shapes, sizes, and abilities. Round is one of them. With Monica at the finish line! I continued to feel awesome for hours after the run. The problem was that I ignored reason and later that same day went for a long walk with a friend. I wore my Polar M200 watch all day, which in addition to the GPS tracker for my runs, it also has a built in step-counter to track all other activity I do if I choose to wear the watch beyond my runs. I was so caught up enjoying the conversation that went along with the walk, that I didn’t realize that in addition to running 5km, I walked another 9km between this walk and other errands I got up to that day. My abdominal area was very achy that evening. I felt better with rest so I knew I didn’t do anything harmful. But one doesn’t want to be achy! Of course fear set in that the reason for my achiness was the 5km of running, rather than the fact that I covered 16km of distance over the course of the day. Were my running days now over? Of course not, but the doubt set in nonetheless. My next run after Kits Fest didn’t happen until the following Tuesday. The plan was to go for a run at the track after work. But it was a really hot day and one where I didn’t get a lot of movement in my day until I arrived at the track. I arrived to heavy legs and very swollen ankles. I found running extraordinarily challenging as I could only make it around the track one time before I had to take a walk break. So I did a total of 4km that day, running 5 x 400m laps one at a time with 5 x 400m walk break laps in between (10 laps total). This of course was a much much slower workout still to what the Kits Fest 5K was given that I literally walked half the distance. I knew that this was because of the hot weather and swelling but it was a challenging run coming on the heels of an achy post-run experience after Kits Fest. So it left me a little worried again. Now are my running days over? Again the answer was “of course not” as I knew full well why this run was challenging. I’ve made the decision now that I will only run in the morning. Swollen ankles are OK for slow walking, but not for anything athletic! My next run after that was my most recent run – this past Saturday. I returned to the track first thing in the morning with fresh legs and had a great workout. In fact, perhaps because the previous workout was so challenging, this run felt remarkably easy. I was able to complete my 5km in just over 36 minutes. I felt empowered and now I’m contemplating what’s next. I took this picture of my perspective looking down at the track and find it quite funny; I really had to stick out that foot to see it! I’d love to participate in the Eastside 10K (run 5k, walk 5k), but it’s sold out so I’m hopeful I can find someone who wants to transfer a bib to me. Then there’s the inaugural North Van Run 5K on Oct 1st. I’m confident in my ability to do both of these events, even if I end up walking more than I run.